On Wednesday, I decided to pay bartender Todd Maul a visit at Clio. For a starting point, Todd recommended the Dr. Cocktail off of the menu for he wanted to show me his recently reformulated Swedish Punsch recipe. He and Randy Wong (of Helen the Pacific and Chee Hoo Fizz fame) improved on the house recipe to the point that one of Todd's Swedish patrons gave the thumbs up. For the drink, Todd's choice of recipe differed from the Doctor Cocktail in Harry McElhone's 1927 Barflies and Cocktails which is equal parts Swedish Punsch, orange juice, and lemon juice. 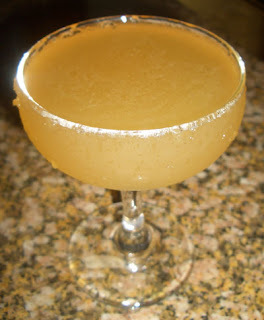 In between Harry's recipe and Todd's was Frank Meier's 1936 one from The Artistry of Mixing Drinks which is equal parts Swedish Punsch and Bacardi Rum with a teaspoon each of lemon and orange juice; Ted Haigh commented that the addition of rum to the recipe raised the drink to a higher level. The one Todd chose took some elements from Trader Vic who suggested a darker rum than Meier and offered the option of swapping the lemon and orange for lime juice (albeit with different proportions). With Todd's recipe and his housemade Swedish Punsch, this recipe came out with a rather delightful balance. The Dr. Cocktail first presented itself with the spice and funkiness of the Swedish Punsch on the nose. Next, a lightly-sweet lime sip was chased by the aged rum, the lime's crispness, and the punch's dryness from its Batavia Arrack and tea tannins. I had one of these on my recent, very first trip to Zig Zag Cafe. I didn't get a chance to flirt with the legendary Mr. Stenson, but I did make moony eyes at him from across the room as I sipped my Dr. Cocktail. Todd made one of these for Andrea and I got to try it. Definitely a great drink -- especially with the Clio house Swedish Punsch!